Given that I’ve been focusing this year on being disciplined and writing EVERY SINGLE DAY (something I had to stop doing for 2 weeks while JT was here visiting me from Vancouver), and that I write first thing in the morning (4:45am, for the most part, although when I sleep in I start working at 6:00am and writing, even on weekends), I knew that I needed to have the best possible setup as a home office. 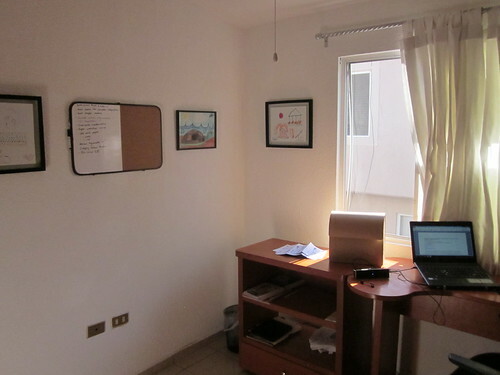 Having a well-designed home office increases my productivity and encourages me to write. I have spent a small fortune in having my home office desk, bookshelves and accessories made-to-fit, but I figured I had to design an actuall, full-blown office at home. 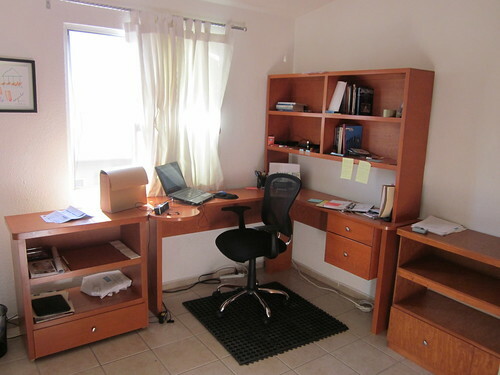 My house is 3 bedrooms, 2 stories and thus I knew that I would be assigning one of the bedrooms to my home office. I have set up high-speed wireless internet connection at home, and an all-in-one printer (which you can’t picture right now because I just bought it). I also added a corkboard and a whiteboard, so that I could follow up with whatever writing or research commitments I have. In my home office, in a similar fashion but not quite like my office at CIDE, I have framed drawings that my nieces and nephews have created for me throughout the years, for motivation. Overall, I’m quite proud of my home office. I recognize this kind of set up is unique as I am a single guy who lives in a 3 bedroom house and thus I have tonnes of space to arrange my life around, but I figured it might be of interest to anyone who reads my research blog. 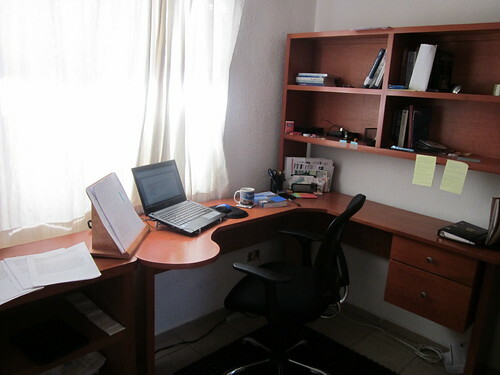 Also, when I talked about discipline in writing earlier on my blog, I mentioned that I don’t leave my home office (nor my house) until I have written at least 30 minutes, and even better if I have managed to write for 2 hours (normally from 4:45am to 6:45am). I can then head to the university by 8:00am. My rule is never leave the house (and my home office) without having at least written for 30 minutes. Tagged with home office, productivity, research, writing. to be more productive, i am using 2X22″ widescreen monitors, thus i can easly read from one and write to another monitor. Strongly recommended. Your office is so much better than my office.